John Cox, California Governor Candidate, Provides Key To Reversing Sanctuary State Ruinous Policies to review not only the qualifications of Mr. Cox to be the next California governor but also the high stakes of this election for California & ultimately America. The California primary (jungle primary as it is known) is on June 5 & the top two candidates, regardless of party, proceed to the gubernatorial election on November 6. Click here to see the list of primaries scheduled across America before the congressional midterm elections on November 6. There are 17 primaries scheduled in June with primaries in Arkansas, Georgia, & Kentucky scheduled for May 22. 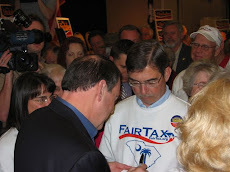 This post documents the anti-American actions, behaviors, & voting records of several incumbent politicians regarding five disturbing accounts that should be considered before casting ballots in the primaries or the November elections. The accounts will clearly show the members of the one Big Government Party that has Democrat & Republican wings that are not @ all interested in the citizenry's best interest but rather whose every move, word, & syllable is calculated & planned to retain their own salaries & perquisites until they are physically unable to function in elected office. Between now & November 6 is the time for concerned citizens to become involved in the electoral process to the point that they determine for themselves which politicians are really against them, regardless of what they say, & then vote the bums out. If your incumbent representative is identified below, in one negative way or another, it behooves you to consider a primary opponent the next time he runs for office so that you have the opportunity to effect real change. This post provides useful information in that regard. If six months ago you never heard of Gina Haspel you are not alone. Ms. Haspel has spent 33 years with the Central Intelligence Agency (CIA) with most of her career being undercover meaning only her superiors knew what she worked on. Ms. Haspel worked her way up to Deputy CIA Director in 2017 & then to Acting Director in April when Mike Pompeo left the director's position to become Secretary Of State. Ms. Haspel is President Trump's nominee to be the new Director of the CIA. Last week I watched Ms. Haspel's hearing live on C-Span & it was a combination of brutal & embarrassing as senators with no real lasting accomplishment in service to America, compared to Ms. Haspel, asked one question after another that wreaked of hypocrisy about her possible involvement of waterboarding Islamic Fascist terrorists who had knowledge of the airplanes flown into the twin towers & Pentagon on September 11, 2001 killing 3,000 innocent people. You would have thought Ms. Haspel decided what to do herself with these terrorists instead of relying on the procedures approved & directed by her superiors – which @ the time there were plenty. Completely forgotten, & certainly not mentioned, by the holier than thou Democrat senators on the interrogating committee was the fact that selected members of Congress had been fully & repeatedly briefed, without a word of objection, on all of the procedures used by the CIA after 9/11. Two of those members are still in Congress today – Nancy Pelosi, House Minority Leader (D, CA) & Senator Richard Shelby (R, AL). Neither Pelosi, Shelby, or any other member of Congress, who were informed of CIA procedures in the early 2000s, including the use of waterboarding, voiced or registered any disapproval. These members of Congress, who raised no objections to waterboarding when it counted, should be every bit as subject to the wrath of the interrogating senators as Ms. Haspel – or else the matter should not be brought up @ all. Particularly obnoxious during the above mentioned hearing was Kamala Harris (D, CA), Diane Feinstein (D, CA), & Ron Wyden (D, OR). Now we don't know whether or not Ms. Haspel was really thinking the thought expressed in the photo above during the hearing – but I know I was. Ms. Haspel was confirmed by the full Senate by a vote of 54 to 45 with John McCain not voting. Rand Paul & Jeff Flake were the two Republicans who voted against her. The six Democrats who voted for her were Mark Warner, Jeanne Shaheen, Joe Manchin, Heidi Heitkamp, Bill Nelson, & Joe Donnelly. 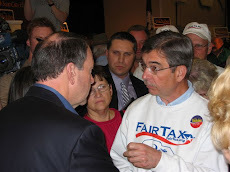 The disingenuous part is that Manchin, Heitkamp, Nelson, & Donnelly all face tough reelection races in their states that were won by Trump by large margins – these people have been no help moving a positive agenda for America forward under President Trump until now except for a very rare occasions – when it suited their political purposes. If the outrage expressed during the hearing by Kamala Harris & the other moralistic senators was real & both the CIA & Gina Haspel were as rotten as they portrayed them to be the CIA would have been disbanded years ago & Ms. Haspel would not have advanced from a case officer to Director of the agency. Following the attacks of 9/11 I don't remember one person who was not for fighting the Islamic Fascist terrorists with whatever means proved effective in keeping the homeland safe & bringing those responsible for the deaths & destruction incurred on 9/11 to justice. This included waterboarding which had been part of the U.S. military training since WW II under the SERE (Survival-Evasion-Resistance-Escape) program under which thousands of our own military personnel have been subjected to enhanced interrogation – including waterboarding. Politicians who say they don't distinctly remember this are playing us for fools using some pretend standard of moralistic values that we clearly didn't apply when our very existence was thought to be @ stake in the early 2000s - like the unrestrained & widespread profiling that resulted in many Pakistanis self deporting from NY to Canada. Source: Heather Mac Donald of the Manhattan Institute. 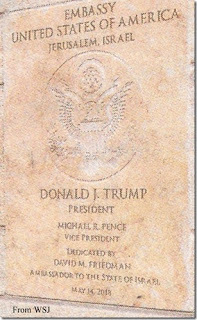 Ever since 1995, in response to the Jerusalem Embassy Act of 1995, American presidents (Bill Clinton, Dubya, & BO) & politicians (e,g,. Democrat Senator Chuck Schumer of NY) have promised to move the American embassy in Israel from Tel Aviv to Jerusalem. All three of these previous presidents delayed the move indefinitely by one six-month interval after another in accordance with a provision of the act. Last week President Trump made the move to an elated Israeli response to coincide with the 70th anniversary of the Israeli Declaration Of Independence. 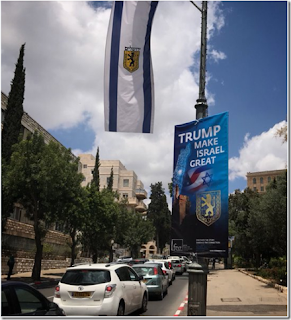 See photo below that shows the banners that lined streets before the U.S. embassy move. 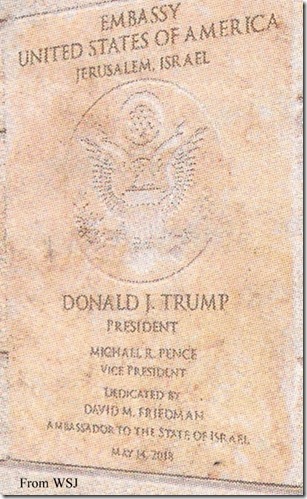 Although there were contrived photo–ops in America from Democrats regarding Israel's happy day, there was not a single elected Democrat in attendance to celebrate the historic embassy dedication ceremony in Jerusalem. Democrats are so blinded by their hatred of Trump that they could not attend or join in this happy Jewish occasion. Democrats regularly receive 75% to 90% of the Jewish vote in any election. This embassy event should make Jews re-think whether their religion really should be liberalism-statism or Judaism & where their best interests lie. On March 23 President Trump signed HR 1625 – Consolidated Appropriations Act, 2018 (also known as the Omnibus Spending Bill), into law (Public Law No: 115-141) saying he would never do such a thing again. The bill, totaling $1.3-trillion, funded the federal government for fiscal year 2018 that began on October 1, 2017 so it was almost six months late for starters as to what was wrong with it. A deal had been made by members of Congress to break previously agreed to budget caps by adding $80-billion to Defense outlays & a similar amount to domestic discretionary programs favored by Democrats. The agreement reopened the federal government which had been shut down briefly overnight. The House vote was 256 to 167 – click here to see how your congressman voted. The Senate voted 65 to 32 – click here to see how your two senators voted. If the votes of your elected reps are surprising you should check to see why they voted the way they did – for instance, Cory Booker, Kamala Harris, Bernie Sanders, & Elizabeth Warren – four senators with presidential ambitions - all voted Nay as did Rand Paul but for very different reasons. Those who voted for the Omnibus Spending Bill & those who didn't for political reasons like they hate Trump & thought it would look worse for him with the government shut down should have to prove to you that they have an ounce of financial responsibility in them before you vote for them. Rand Paul summed it up this way back in February – "The dirty little secret is Republicans are clamoring for military spending but they can't get it unless they give the Democrats welfare spending so they raise all the spending, it's a compromise in the wrong direction . . . when Democrats are in power Republicans appear to be the conservative party, but when Republicans are in power it seems there is no conservative party." The next budget government funding tension filled episode could occur @ the end of September when we will find out what will be different this time that will let President Trump sign a more fiscally responsible bill – the only type he says he will sign from now on. My guess is nothing will be different thereby setting up a dramatic clash a month before the midterms that will provide very good information for voters. There was plenty of outrage in the aftermath of the Senate's miserable failure to fulfill a campaign promise to repeal ObamaCare - made over seven years & four consecutive election cycles (2010, 12, 14, & 16). For the last seven years of BO's presidency the Republican Congress voted to repeal ObamaCare in one form or another sixty two times by one count. One of those sixty two times included a clean repeal only bill that should have been put on President Trump's desk for signature on January 20, 2017 if there was really two opposing political parties. Of course we know it wasn't because all of the RINOs who had voted for the repeal only bill when they knew BO would veto it would not vote for it when they knew President Trump would sign it. These are the worst kind of politicians – people that voters rely on to keep their word but in reality have no intention to do anything that is not politically correct which in their minds will keep them in office. Click here to see the House repeal-only vote in 2016 & here to see the Senate repeal-only amendment vote. Since a repeal only vote never came up when it counted with Trump ready, willing, & just itching to sign it you will have to call the congressional switchboard in Washington @ 202-224-3121 to ask your elected representatives how they would have voted if such a repeal only bill had come up – you can reach any senator after pushing 1 & any congressman after pushing 2 after reaching the number given. Ask how they intended to vote if a 2017 repeal-only bill was presented & see what you learn. It is not as good as seeing the actual vote when it counted but the phone call is the next best thing if you are interested - then you will know what they say but will still have to guess what they believe. Navy Admiral Dr. Ronny Jackson has been the personal physician of the last three presidents & all have given him glowing praise. But after President Trump nominated Dr. Jackson to head the Veterans' Administration (VA) allegations of misconduct started coming out of the woodwork. The Pentagon started investigations after Montana Democrat Senator Jon Tester led the accusations against the Dr.
Dr. Jackson removed his name from consideration, saying all of the allegations were false, but the damage was done. He is no longer the president's personal physician & no longer heads the White House Medical Unit where he still works. Now I don't know what is true or false regarding Dr. Jackson but I do know that with all the investigations going on in Washington one should be conducted to find out how someone could have the clearance to be the personal physician for three presidents but was so reckless that he was disqualified from an administrative job to head the VA. The citizens of Montana should nominate Senator Tester to head this investigation. "If you're employed & looking for a new opportunity, it's a great time to look. 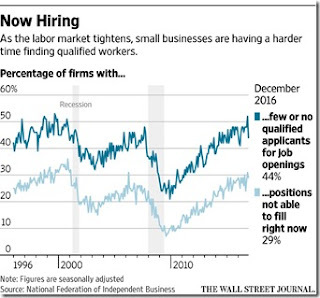 If you're unemployed, & you have skills that are current, this data bodes very well for your jobs search." – Paul McDonald, senior executive director @ staffing agency Robert Half, talking to the WSJ. Mr. McDonald was referring above to the fact that jobs openings increased in the past year by 943,000 (March to March – with 472 thousand increasing between February & March) while the number of unemployed people in the labor force decreased by 586,000 thereby bringing the number of job openings & number of unemployed people essentially into equilibrium. See graphic above where the two lines on the right side of the graphic touch. 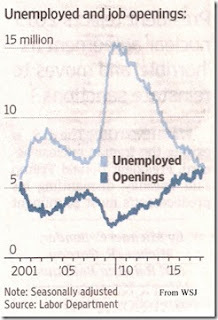 At the height of the Great Recession the ratio stood @ approximately seven unemployed people for every job opening. Although unemployment figures were released for April earlier this month the latest job openings figures are for March because the job openings figures for April won't be available until June 5. The job openings rate is the number of job openings on the last business day of the month as a percent of total employment plus job openings. It was 4.2% in March according to BLS. 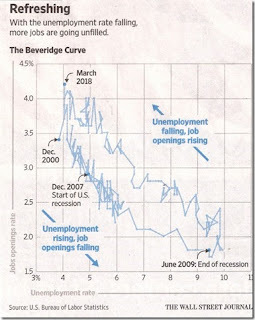 The above relationship between unemployment & job vacancy can be shown graphically on what is known as the Beveridge curve. 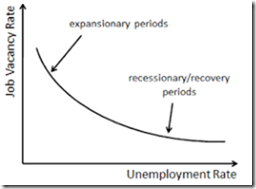 This curve is hyperbolic shaped and slopes downwards as a higher rate of unemployment normally occurs with a lower rate of vacancies as indicated in the generic graph below. 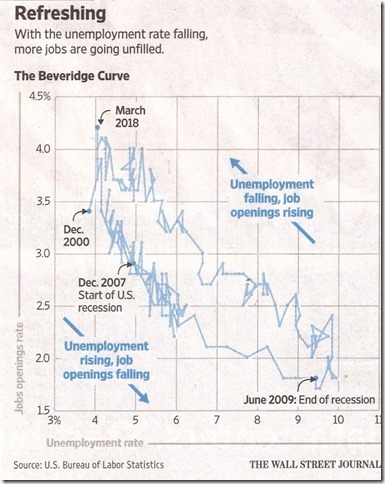 The actual Beveridge curve for the series of data from December 2000 to the present is shown below – each stage follows the expansionary or recessionary hyperbolic form of the above generic graph. Note the hyperbolic downward sloping curve from December 2000 to the end of the recession in June 2009 followed by the upward sloping hyperbolic parallel curve rising with unemployment falling & job openings rising to the March 2018 point @ the top left of the graph – a record for this series of data. The number of unemployed people in April was 6,346,000, a drop of 239,000 people, so the trick will be to keep the job openings rate steady, or preferably increasing, so that not only the unemployed find work but also the 408,000 discouraged workers, who are not in the labor force looking for work because they believe no jobs are available for them, find work too. There are also 5-million people working part-time for economic reasons – these people prefer full-time employment but are working part-time because either their hours had been reduced or they were unable to find full-time jobs. Another 1-million people are considered marginally attached to the labor force in April because they had not searched for work for reasons such as school attendance or family responsibilities. Putting all of the above people back to consistent steady full-time employment, where they earn a paycheck from a private employer, will increase economic growth & prosperity for the country. Although the above statistics look promising businesses are already experiencing headwinds in meeting their employment needs. The graph below shows the increasing number of small businesses that identify the quality of labor as their biggest problem. 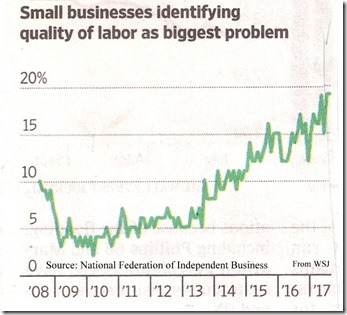 The graphic below shows more detail of the labor quality problem. Now the people without work described above can count on employers to train them – & that is starting to happen to some degree – or they can take it upon themselves to get the proper training to become a successful job applicant. The first step is for the unemployed, & really the employed also, to realize what a job really must do – what the definition of a job is: Professor Stuart Meyer defined a job as "an opportunity to create more present or future value for an employer than it costs to maintain the worker in the job. Once the value drops below the cost, the job disappears, except as a sinecure or subsidized position." Fred Charette has pointed out that "only entrepreneurs create jobs by risking career & capital to start & build businesses that employ people to make useful things & provide needed services. By contrast, the government ... destroy(s) jobs." But go a step farther to understand why we need unfettered free enterprise to dispel all of the misconceptions about the term "creating jobs": Bill Burbage writes - "no entrepreneur has ever had the objective of 'creating jobs'. (In fact) they constantly seek to eliminate jobs. People go into business to make a profit. If any jobs are created in the process there is no way to avoid it. To create more jobs, the sovereign must remove as many obstacles as he can between the entrepreneur & his ability to make a profit. No other stimulus is necessary." But to understand how value producing jobs are created think of the world economy as a ladder - a metaphor presented to me several years ago now by Professor Robert Carbaugh of Central Washington University. The U.S. is currently on the top rung & developing nations with low tech labor intensive jobs are on the bottom rungs. The other countries are in between. All countries try to climb to the next rung. This works well if the topmost countries create new industries & products, thus adding another rung to the ladder like when we replaced horse drawn carriages that used buggy whips with cars. Older industries can move overseas while new jobs are generated @ home. It is when innovation stalls @ the highest rung that the portion of Americans near the bottom of the income distribution must compete with workers in developing countries. This is what many of the people - the unemployed & underemployed @ this late date in the recovery, the discouraged, & the marginally attached to the labor force - are facing today being poorly educated with skills so limited that no employer can use them. It is only through constant brainwashing that the government will take care of you that would allow someone to become so ill-prepared to support themselves that they are now competing with third world people who make pennies a day. For all the readers of RTE who enjoy the quizzes I present from time to time but would like a little less math or logic involved I have good news. Thanks to Cindy Mascone, Editor-in-Chief, of CEP magazine I have found a brain-teasing grammar quiz. This is one that English teachers in the readership have been waiting for. For all of us who have not diagrammed a sentence since high school we have come to rely on an intuitive sense of what is linguistically appropriate in writing a letter or a post. The Buffalo Quiz below will test that intuitive sense or your ability to diagram a sentence. Please let me know your answer to the quiz – I will post all correct answers or alternatively will send the solution privately to anyone who requests it if no one figures it out. Please consider the following arrangement of the same word in quotation marks below that really does make up a well-formed sentence in the English language that follows the rules of grammar. How can "Buffalo buffalo Buffalo buffalo buffalo buffalo Buffalo buffalo" be a real grammatically correct sentence? At its core what does the sentence say?